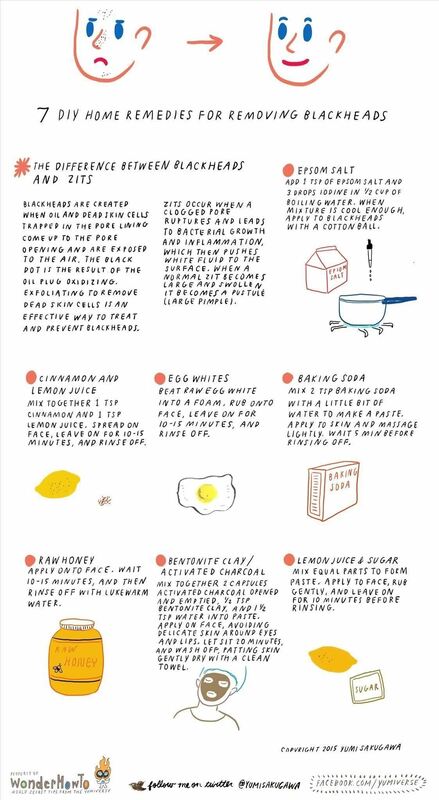 While blackheads are a little different from your run-of-the-mill acne and zits, they are still annoying when they appear on your face and, thankfully, can be banished with a number of DIY home remedies incorporating common household products. Blackheads are created when oil and dead skin cells trapped in your pore lining come up to the pore opening and are exposed to the air. The black appearance is the result of the oil plug oxidizing. To prevent blackheads from occurring in the first place, one effective method is to exfoliate your skin to avoid dead skin cell build-up using baking soda and water, lemon juice and sugar, or even raw honey. Read below for more techniques on preventing and eliminating blackheads breakouts. Click on image to enlarge.